The town of Shrewsbury (pronounced Shrozebury) nestles within a large loop of the River Severn, which is spanned by two splendid 18th century bridges. The town is filled with romantic 15th century half-timbered Tudor houses, huddled together, within attractive alley ways and picturesque streets. 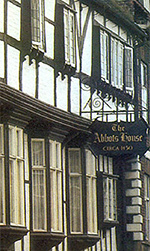 The Abbot's House (circa 1450), located in Butcher Row, is one of many examples of the well-preserved, black-and-white, houses that make Shrewsbury one of the finest Tudor towns in the country. There are also a number of fine Georgian terraces and many excellent examples of 17th, 18th and 19th century architecture. The most notable of these are the town's civic library, museum and art gallery, which are housed in the l7th century buildings of Shrewsbury's famous old public school. Shrewsbury's magnificent red sandstone Norman Castle has faithfully defended the town from Welsh invaders over the centuries. It was founded by Roger de Montgomery, around 1070, on the site of an earlier Anglo-Saxon fort. 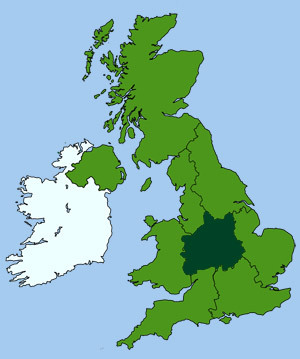 It was from its very gates that Henry IV rode out to conquer the Welsh rebels at the Battle of Shrewsbury, in 1403, just north of the town. Its walls were extensively restored in 1788 by Thomas Telford, who converted it into a dwelling. Its main hall is now a Regimental Museum. Several outstanding churches in Shrewsbury include the Norman and later Abbey Church. The mainly 18th century St Julian's, with its ancient towers, and the circular, domed, 17th century St Chad's Church (one of the few round churches in Britain), which overlooks the River Severn. Other find buildings in the town are Rowley's Mansion (which houses a museum), Whitehall circa 1582, the gateway of the half-timbered Council House, the Lion Coaching Inn and the small group of 14th century cottages, shops, plus the beautiful old 'Bear Steps' hall. Parts of the old town walls, including a 13th-century tower, also survive. The town's lovely Dingle park gardens were created by the late Percy Thrower (one of Britain's best-known gardeners), from the town's old quarry, where much of the rich red sandstone for the town's buildings originally came. 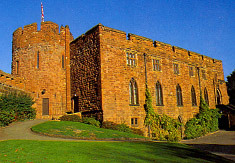 The museum is housed in the main surviving building of Shrewsbury Castle. It was extensively rebuilt in the 13th century to guard the Welsh borders but still has its original gateway of 1083. The museum is dedicated to the King's Shropshire Light Infantry and The Shropshire Yeomanry. The castle grounds also contain a medieval 'matte' and the romantic Laura's Tower. Shrewsbury Abbey was at one point a	candidate for the seat of a bishop, until Henry VIII decided that this would be too costly. Only the west tower and nave survive today. A magnificent timber-framed warehouse, with an adjoining brick built mansion. It was built for the Rowley family, who where brewers, drapers and mayors of Shrewsbury during the early 17th century.